The distribution of workload among computing resources to optimize performance. Process of measuring and adjusting equipment to obtain desired flows within the system. the balancing of rotating machine parts (the rotor of a turbine or electric motor, a crankshaft, pulleys, and so on). For most rotors in machinery, the axis of rotation is the axis passing through the centers of the bearing surfaces of the journals. Misalignment of that axis and the principal axis of inertia, which can result from errors in the fabrication technology of the part or from design features, gives rise to uncompensated centrifugal forces and moments, causing rapid wear on the bearings, increased vibration of the machine, bending oscillations of its components, and so on. In the balancing operation, the axes are brought into alignment by placing balancing weights on the part tested, by removing unbalanced (excess) weights, or (in some special cases) by centering the article at the points where the principal central axis of inertia intersects the surface of the part; the axis of rotation passes through those points. Balancing is done on balancing machines. The choice of the required number of planes for corrections is determined by the type of balancing machine used. Depending on the mutual positions of the principal central axis of inertia, the axis of rotation, and the axis of the part, a distinction is made between static balancing, dynamic balancing, and balancing of flexible articles (dynamic straightening). Axes 2–2 and 3–3 (see Figure 1) coincide in static balancing and dynamic balancing. Figure 1. Balancing diagrams: (a) static; (b) dynamic; (c) balancing of flexible articles; 1—1 is the principal central axis of inertia; 2—2 is the axis of rotation; 3–3 is the axis of the article; CG is the center of gravity; m is an unbalanced mass; P, P1 P2, and P3 are counterweights. Static balancing is used when the principal central axis of inertia becomes displaced parallel to the axis of rotation. In the case of a part with an unbalanced mass m and a balancing weight P (see Figure la), balancing involves compensating for the centrifugal force generated by the mass m as it rotates, and is brought about by positioning the weight P in one correcting plane. The relationship between the balancing weight P and the displacement e of the center of gravity (displacement of axes) is given by the formula P =∊ G/r, where G is the force of gravity and r is the radius at which the weight is mounted. The term “static balance” has its historical roots in the fact that mass imbalance can be detected statically by placing the part on straight horizontal guides on which a rotor will turn heavy side downward because of the gravitational force acting on the unbalanced mass. However, this is an imprecise method, and static balancing under dynamic conditions is preferred. Dynamic balancing is used when there is an angular displacement of the principal central axis of inertia relative to the technological axis of rotation; the axes then intersect at the center of gravity of the part (see Figure lb). The relationship between the balancing weights P and the angular displacement φ of the principal central axis of inertia is expressed by the formula P =φI g/rl, where I is the moment of inertia of the part, g is gravitational acceleration, and l is the axial distance between the weights. In this case dynamic unbalance is a consequence of the centrifugal moment and can be offset by placing the weights in two correction planes generating a compensating couple of centrifugal forces of arm l.
where b1, b2, and b3 are the axial coordinates of the correction planes. Four weights must be placed in four correction planes in order to achieve balancing near the second critical velocity, and so forth. All of these aspects of imbalance are capable of acting on the article simultaneously, in which case the balancing problem will be complex. Only in some individual cases is it feasible to rely on only one mode of balancing—for example, static balancing is adequate in the case of flat articles. Quality balancing work requires that the balancing tolerances be set on the articles, and these tolerances are expressed by convention in the allowable displacement of the center of gravity ∊(in microns) or in the allowable imbalance u = rP (in g-cm). Artobolevskii, I. I, “Uravnoveshivanie sil inertsii ploskikh mekhanizmov.” Izv. nauchno-issledovatel’skogo in-ta mashinostroeniia,1935, no. 10. Krylov, A. N. “O dinamicheskom uravnoveshivanii rotorov i giro-skopov.”lzv. nauchno-issledovatel’skogo in-ta mashinostroeniia, 1935, no. 7. Krylov, A. N. O nekotorykh differentsial’nykh uravneniiakh matematicheskoifiztki, imeiushchikh prilozhenie v tekhnicheskikh voprosakh,5th ed. Moscow-Leningrad, 1950. Shitikov, B. V. Dinamicheskaia balansirovka rotorov. Moscow, 1951.
a genre of circus art centered on the performer’s ability to maintain his equilibrium in any unstable position of the body while on a tightrope, large ball, or trapeze. It is often combined with acrobatics and juggling. 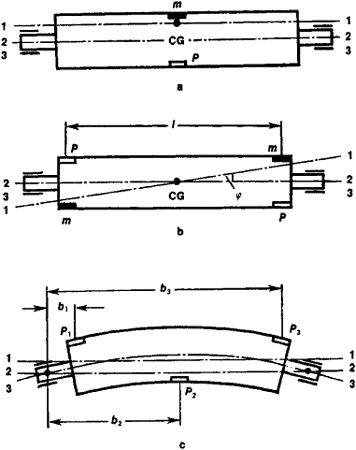 A procedure for adjusting the mass distribution of a rotor so that vibration of the journals, or the forces on the bearings, are reduced or controlled. Additional features for global server load balancing, SSL acceleration and upcoming enhancements from Coyote Point can be added incrementally to any Equalizer SI Series appliance. For firewall load balancing the BIG-IP solution, deployed in a firewall sandwich configuration, efficiently load balanced NOKIA IP 530 firewalls, enhancing the performance and reliability of these devices. HydraWEB is the leading e-business infrastructure company, building Internet load balancing and resiliency appliances for companies whose businesses depend on the reliability of their Web sites. Based in New York City, HydraWEB has the load balancing power for maintaining the performance and availability of the most sophisticated and highly-trafficked Web sites, like Bear Stearns, Bridge Information Systems, Juno Online and DLJdirect. Switching, load balancing and other server functions are performed at wire speed by the IN-Switch processor. The IN-Switch is a multilayer switch that also performs dynamic load balancing on IP packets at wire speed. HH100 constantly collects and acts upon statistics from multiple HydraWEB Load-Balancers within various content clusters, which in turn collect information from their backend servers and applications within those clusters to refine the entire site's balancing decisions. 80% of the Fortune 500 Securities Industry Companies and other Industry giants, including Bear Stearns, Lehman Brothers, Morgan Stanley, Merrill Lynch, and DLJdirect deal with these swings in transaction loads by investing in HydraWEB's load balancing technology as a key component for their mission-critical Internet operation. To assure reliable access for their financial transactions as well as the information used to make mission critical market decisions, 60% of the Fortune 500 Companies in the Securities Industry use load balancing appliances from HydraWEB Technologies, Inc.